I think the reason I never liked ice cream (I know, how can that be?) is that I've never liked dairy. I'm perfectly fine with sorbet and vegan ice cream. Especially this one. The raisins are plump and the cashew base makes it so creamy. I'd advise you to start with 5 g of maca powder if you've never used it. I found it takes quite a bit to adjust to the flavour that can be overpowering at the beginning. 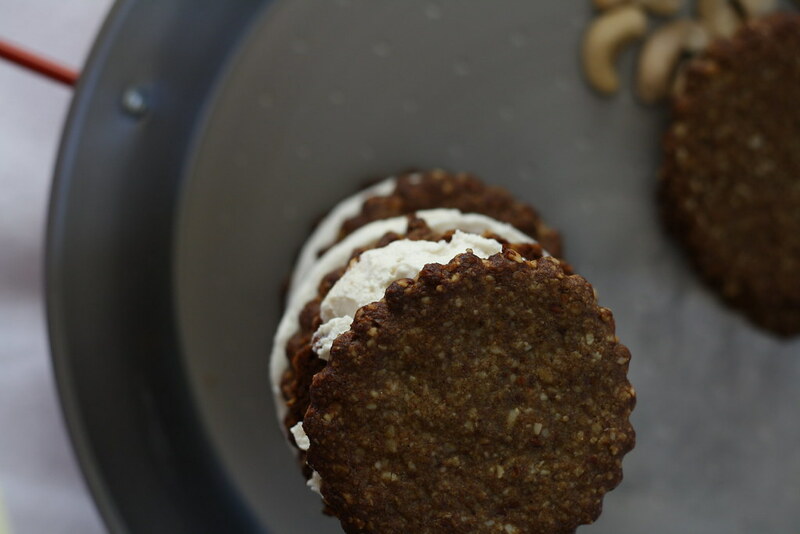 You can use almond flour instead of coarse almond meal, the cookies will look less "rustic". In a bowl, combine all dry ingredients. Stir in the wet ingredients and mix until it forms a dough. Roll out dough onto a surface lined with parchment paper and sprinkled with almond flour. Cut dough with a 7-8cm round cutter. Bake for 13-15 minutes or until edges start to brown. Transfer onto wire rack and let cool completely before freezing them. Soak raisins in rum for 15 minutes. In the meantime, in a blender, blend the pre-soaked cashews with 20 cl water, maple syrup, lemon juice, vanilla extract and salt until smooth. You might need to add a little extra water depending on desired thickness. Add in the raisin and rum mixture and mix well. - line 4 ramekins the size of your cookies with parchment paper. Fill the ramekins (up to 3 cm) with cashew ice cream. Freeze for at least 3 hours. Remove the ice cream from the ramekins and place between 2 frozen cookies. - pour cashew ice cream into a freezer container Freeze overnight. Let thaw for 15-20 minutes. Using an ice cream scoop, sandwich a big scoop of ice cream between two frozen cookies. these look absolutely beautiful and delicious! i've never tried maca before. what exactly is it used for? thanks Caitlin! The ice cream is a killer, I even ate it for breakfast (it was in August, I need myself a warm breakfast now...). Maca is a root from Peru (I use maca powder) , it helps reach hormonal health and cope with stress and it's packed with B vitamins! You have a serious sweet tooth :-) très joli !